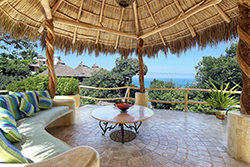 Villa Amor 2 Bedroom villas in Sayulita at the Original Villa Amor, where elegance meets the beach. You will experience stunning views, yet you will still feel secluded and private in your villa. 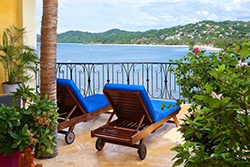 Unique furnishings from around the world, exquisite views of the Sayulita bay, and an unbeatable staff ensure your Sayulita vacation will be like no other. You may never want to leave these lush, tropical grounds, complete with new swimming pool and yoga center, open-air beachfront restaurant/bar and your beautifully appointed villa. Villa Amor has fiber-optic high speed wireless Internet so you never have to worry about staying connected. Utilize the contact form on the right to inquire about your Sayulita vacation. Our reservation experts are standing by to give you friendly, professional service. Villa Las Flores: This beautiful Sayulita villa at Villa Amor features a huge terrace with expansive views of the Sayulita bay. Up to four guests can share these accommodations, which include a well appointed kitchen and an outdoor pool. Villa Las Flores also has its own parking area at its entrance. One King bedroom and one with two singles, which can be left separate, or placed together to create another King size bed. 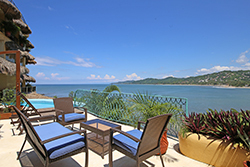 Villa La Paz: With amazing views of the ocean and jungle from the terrace and private pool. Enter through the large, private courtyard and enjoy this stylish and comfortable villa that accommodates 4. With outdoor kitchen and palapa covered seating on terrace to enjoy the weather and the private plunge pool. 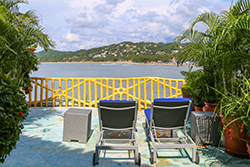 Villa Las Lanchas: Named for the fishing boats that line the Sayulita shore, Villa Las Lanchas at Villa Amor has a view of the entire Sayulita bay. 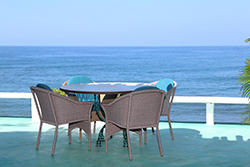 Watch for whales while dining, or enjoy the sunrises and sunsets from your terrace. One King Bedroom and one Queen bedroom, 2 baths, kitchen for light meals, dining area, and an additional two single beds in the entrance foyer mean that up to six guests can be accommodated. Please inquire about fees for extra guests. 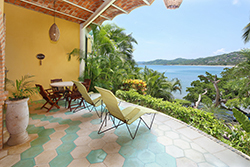 Villa Corazon: Villa Corazon in Sayulita at Villa Amor has a huge terrace with a soaking pool, where you can enjoy great views of the ocean, jungle and the beach. One King bedroom and two singles in the second bedroom can be made into a King. Two baths, a well appointed kitchen, and plenty of room for up to four guests. 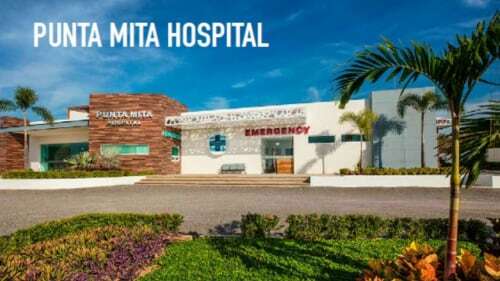 Villa Corazon has a direct access point connection to Villa Amor's fiber-optic Internet so you can be assured that your connection will be reliable and lightning quick. Villa Romantica: Villa Romantica in Sayulita at Villa Amor is a large, 2 bedroom, 2 bath Villa with a/c. It also has a living room and a large deck with a 180 degree ocean view, as well as a complete, outdoor kitchen. One bedroom has a King size bed and the other has two singles. Villa Romantica in Sayulita lives up to its name, and was designed by an artist so there are many artistic touches throughout. Accommodates four guests. 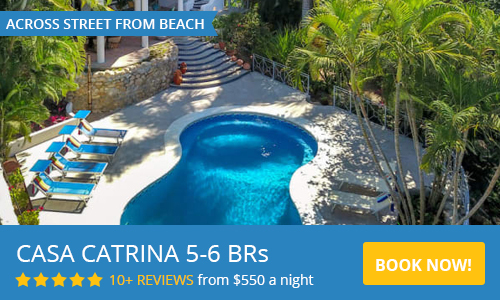 Villa Tortuga (Formerly Cinema): Villa Tortuga is a beautiful Sayulita Villa on two floors, with an upstairs air conditioned loft bedroom and bathroom. The main floor contains a master suite with a bathroom you will love, and an additional small bedroom for two people. Villa Tortuga at Villa Amor has a full kitchen, living and dining room, and a small dipping pool. With three bedrooms and three bathrooms, Tortuga can easily accommodate 6 guests. Villa Armonia: Armonia means harmony, and has a private, single flight of stairs to approache a spacious terrace from the quiet road below. It is a two bedroom one bathroom full a/c Villa, with a nice kitchen, very large terrace and wide open ocean views. With one King bed and two singles, Villa Armonia in Sayulita at Villa Amor can accommodate up to four guests. 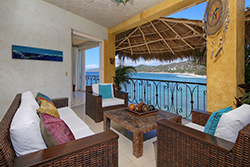 Villa Del Sol: A lovely Sayulita 2 bedroom, 2 bath Villa at Villa Amor with air conditioning. You will approach Villa Del Sol via a short one minute jungle path with no stairs. The view from your terrace and small swimming pool is over a grassy area and looks out to the open ocean. An outdoor shower next to the pool and a complete kitchen round out the villa. One King bedroom and two singles in the second. Accommodates up to four guests. 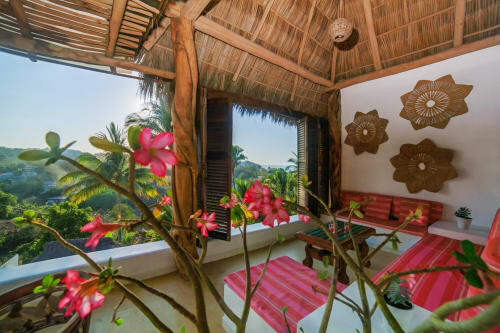 Villa Mar y Sol: Mar y Sol in Sayulita is a large two bedroom, two bath villa at Villa Amor, the master bedroom has two single beds that can be combined to make a King, the second bedroom has a queen size bed. Both have en suite baths. 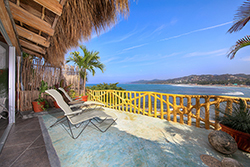 The open living space with kitchen and dining area opens to the terrace where you will enjoy wide sweeping ocean views into the village of Sayulita along the beach and surf break. This villa is easily reached with one flight of stairs leading off the main condo building hall. Mar y Sol is easily coimbined with either Villa Serena or Villa Armonia to form one huge loft-like space sharable by up to 8 guests (4 baths,6 bedrooms) The combinations of the 3 terraces will provide an event space for a gathering of up to 60 guests for dinner, cocktails or reception. 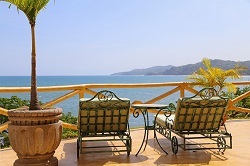 Villa Mar y Sol at Villa Amor, on its own is suitable for up to four guests. Extra guests will incur a nightly fee, see pricing details. 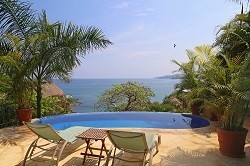 Villa Oceana: Villa Oceana in Sayulita will wow you with its two bedrooms and two baths. 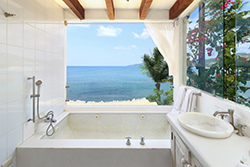 Spectacular views of the beach, village and ocean from every room. Tastefully furnished, with a full kitchen, generous dining and lounge area, spacious master bedroom and study. Highly sought after, Villa Oceana at Villa Amor will be your home away from home. King size beds plus sofa bed. Suitable for four guests. Villa Oceana can also be rented as a one bedroom for two guests at at lower rate, please inquire. Villa Terraza: Aptly named for the huge terrace, Villa Terraza iwill delight you with its expansive ocean views and indoor outdoor living and kitchen space. This is tropical living at its best. The bedrooms can be completely closed and have air conditioning for your comfort. One bedroom has a King and the second has two individual beds that can also be made up into a King if you prefer. There is also an extra bed in the common area that is great for daytime siestas. Villa Terraza accommodates 4 guests, with 5 guests max and there is an extra per night charge for the 5th guest. Loved the huge deck overlooking the ocean. Excellent service too. Delightful Villa overlooking the sea. Quiet and secluded but just a short walk from the vibrant, colorful little town of Sayulita. I have stayed at Villa Romantica several times with friends and can't think of anywhere I would rather stay to recharge and relax. Prices are per night and are in US dollars, and are for four guests. Each additional guest, space permitting, will incur an extra fee of $25 USD per night. 16% IVA (VAT tax); and an additional federal lodging tax of 3% will be added to your invoice. Villa Las Flores: $335, $495, $585 (Low Season, High Season, Holidays) Seasonal dates displayed above. Opción 1: Reciba un reembolso menos el costo de una noche por villa menos cargos (tax y 4% comisión bancaria). Opción 1: Reembolso de 50% menos cargos (tax y 4% comisión bancaria). ó un rembolso del 25% menos cargos (tax y 4% comisión bancaria).